So to update about this week. 1st of all….we went tracting for 7 hours straight on Tuesday. ALL OF OUR APPOINTMENTS FELL THROUGH. (we had 4) and one was a member fhe/dinner haha. Ya….that was fun, we only talked to maybe 10 people and only 1 was really that interested. Faith trying-I would think so. But this is part of mission life, people have agency and as missionaries we simply invite and they choose whether or not they want to accept that. Hence why they chose to cancel/bail on our appointments set up haha. I think you just have to learn to laugh at that because it happens A LOT as a missionary and you can’t take offense or get bummed out but simply keep moving forward. The Lord is preparing people and there are still hearts to be touched and seeds to be planted. We also had a cool miracle happen to us this week with a man named Dan. We were in a neighborhood going to do some stop by’s and we saw a man tending to his lawn. He kept looking at us as we parked our car and were going over the names of people we were going to stop by. We got out and I felt like we needed to go talk to him. We did and quickly realized how friendly and open he was. As he asked us about what we were doing there and then we asked him he said “welp, I’m a 100% non believer!” He kind of grinned to himself and chuckled. Sister Tafua and I began asking him questions about why he felt that way and if he had always been. He stated that he grew up with religion but he figured that everyone preached that if you’re not perfect/accept Jesus/want to be saved your damned. He expressed how he’s always tried to live a good life, treating people well, helping others, being kind and honest etc. And he thought if there is a God, I don’t get why because I’m not a labeled “church attender” that I’d go to hell while other people of a specific faith don’t live their lives like they know they should (hypocrites) and yet think they’re saved? It was a fair argument. And so of course that lead us right into answering those questions about where we came from, why we’re here and where we’re going after this life through The Plan of Happiness. 🙂 We ended up using some leaves, pine cone fragments and blade of grass for visua aids for the plan of salvation ahah it was awesome. I wish I would’ve taken a picture of it. The best part was as we continued to talk he would nod his head and say “ya that makes sense…I mean I don’t know if I believe it yet, but it makes sense” and then later “well lets just hypothetically say that what you guys are telling me was right/true then…” it was so funny. He would say things like “well I guess I’m not a 100% non believer, I’m more open than that….I could believe that….etc”. I love this gospel. I love that I know that I can be with my family forever. I know that God loves us, we are all His children and He knows each one of us individually. And it is through the grace of Jesus Christ’s atonement that we can change, and becoming strengthened and enabled to do hard things as we go through life. It’s about simply being saved by grace, but have we been changed by grace? I read a talk today on that subject and it hit home to me. I love the Savior, Jesus Christ.It‘s because of Him that I’m out here doing this. This is His work. I am His servant. Lots of Detroit tiger’s baseball fans here. 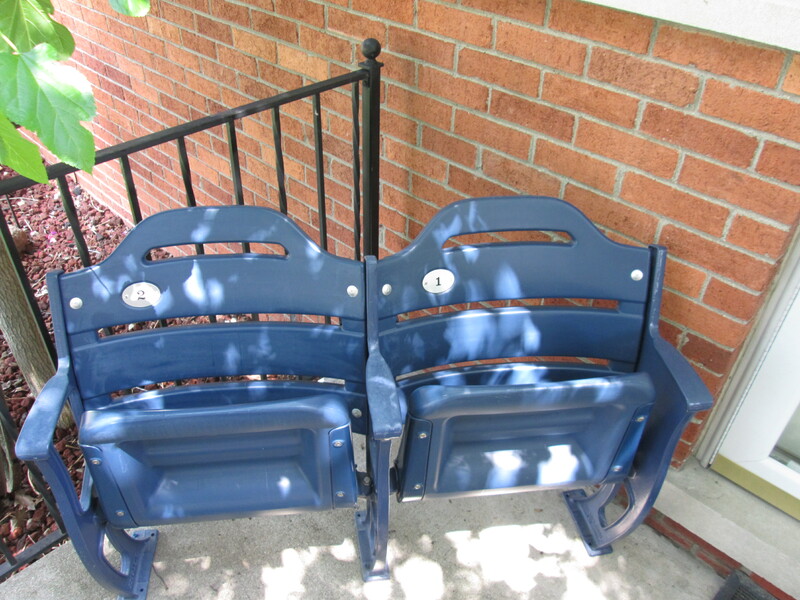 Many porches have baseball stadium seats on them haha pretty cool. So I wanted to get in this email before I forget/run out of time. This week was awesome Monday we had an FHE with a member family and it was really fun. They have 9 kids haha full house-pretty awesome, gets me way stoked for FHE’s in my future family and until then with YOU ALL 🙂 Ps. How are FHE’s coming? song, prayer, lesson\discussion/bonding, game, treat? That’s all it takes and it really makes a huge difference in unifying families. I encourage you all to get into the habit if you’ve been slacking. In today’s world we need strong families and the “greatest work we will do will be within the walls of our own homes”. I know that’s true. 🙂 Hop to it! So this week we did a lot offfff……can you guess? FINDING haha what else can we do? So we picked up some new/potential investigators. I’ll keep you posted, we’ve noticed that people either love telling us no they’re not interested. Or that they’re too afraid and so we go to a set up appointment and they’re not home, or they don’t call us back or text when we try to set something up etc. Frustrating…people have their agency though, we are here to INVITE. 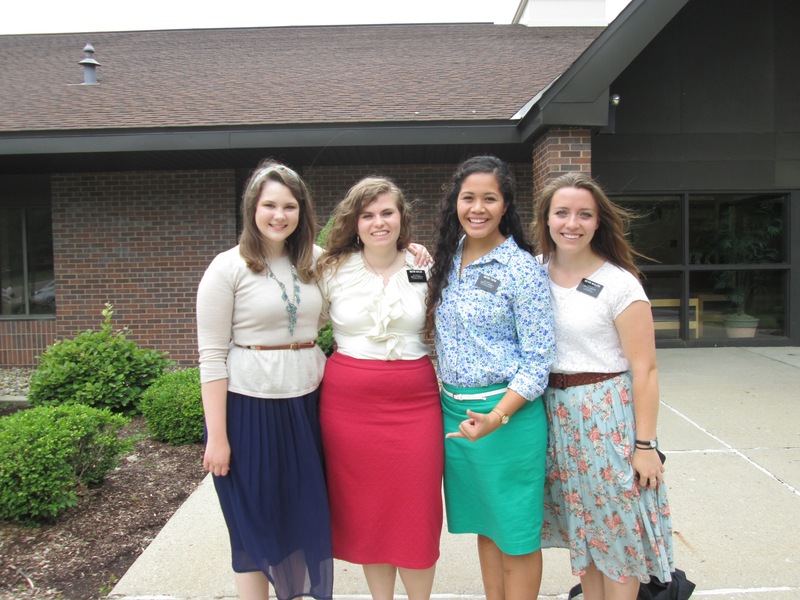 However, this week I went on exchanges (our sister training leader came to my area and sister Tafua left for the day to their area) with Sister Meecham. We stopped by the family that we found about a week ago (the greers) and talked with them for a bit. They’re doing A LOT of rennovations at their house and we offered to help which they kindly declined because they didn’t want to have us do that. Well we set up a time to come back and have a lesson with them that Saturday and they agreed. As soon as we were driving away we got a text from them asking if we could actually come over the next day (Thursday) and help them with the house before Saturday’s lesson. We were ecstatic! We came over the next day and did service and President & Sister Gerber came too! Pretty sweet to be in the Mission home’s area haha. So we helped clean out their garage and paint trim to put up in the house. President talked with Scott (the dad) and answered a lot of his questions. Before we left Scott told president the following “Ya know…I’ve been around a lot of people of many faiths but you guys are the first one’s I’ve seen that actually live what you teach”-WOW! We were amazed that he said that and so grateful. Even if They hadn’t accepted an invite to have a lesson with us we still would’ve gone over to their house to help. That’s what Christ would’ve done and as His representatives that’s what we do. So humbling 🙂 President suggested inviting that family for Saturday’s lesson at the mission home too for lunch so we invited them and they accepted! The lesson went well it was more of answering their questions about Mormons, clearing up misconceptions and trying to get to know them better-again building trust. But they agreed to have another lesson with us on Wednesday. We will be teaching the restoration! We didn’t really get to it the last lesson,I am very excited! We are praying and studying our brains out hoping that we will be guided by the spirit. Can’t wait to tell you about it. The Lord truly has been blessing us. Another miracle that happened was on thursday night 4th of July. 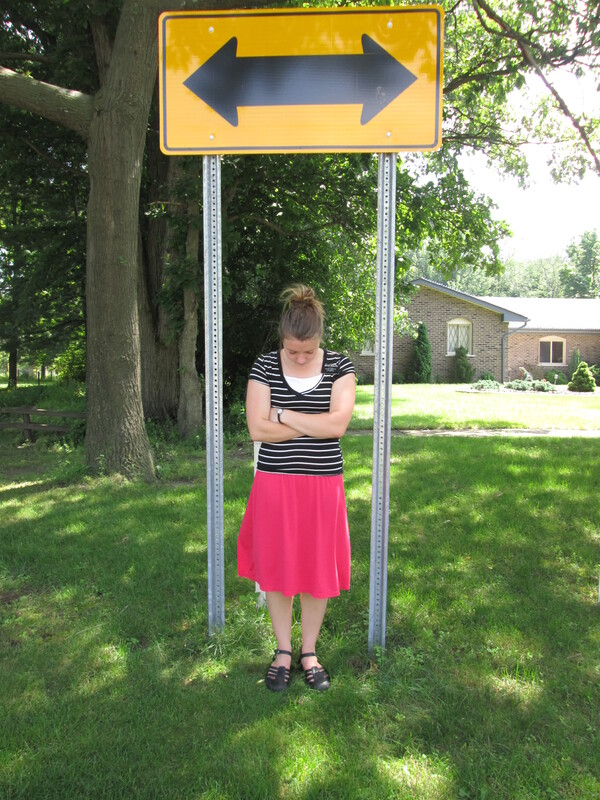 Sister Tafua and I went out finding and it wasn’t going well. No one really wanted to talk to us or people weren’t home-of course it’s a holiday. As we were driving out of the neighborhood to go home we passed a house and I saw a person out on their front poor sitting there rummaging among some potted plants. My first thought was “hey! a black person (couldn’t tell the gender from this distance) we never get to talk with black people!” and then I thought about what time it was and what we had to do once we got back to the apartment etc. and then the other thought came to me “you should go talk to them, at least try”. So I told sister Tafua who said she hadn’t seen anyone and I assured her there was someone there. We stopped the car, said a prayer and walked outside to the house. It was a she after all, her name was Mercy,short for Mercedes and she was from Cuba. Beautiful woman, probably 60’s and she speaks Spanish. She was so pure. I had such a love for her as soon as we approached her-it was so incredible. She began to tell us about her life and then kept asking what we wanted from her. She couldn’t fathom that we were just there to talk with her. That we wanted her to either buy something from us or something. We talked with her about God and what us sisters were doing for these next 18 months. She was in awe. And commented on how rare that is, such selfless service for what? To simply help other people. She told us that she had been having the worst day she’d had in a long time. She keeps losing weight and the doctors couldn’t figure out why. She said that us coming and talking with her and feeling our love was from God. She invited us over for lunch on sunday. And sister Tafua asked if we could bring a friend with us, I looked at her puzzled and sister Tafua whispered to me “Sister Edwards”. Mercy agreed after we told her the friend was from Argentina and mercy loves Argentines, and it was settled. We exchanged numbers said a prayer (I prayed in Portuguese and she understood most of it) then we left. As we walked back to the car sister tafua told me that sister Edwards face kept popping up in her mind as we talked with Mercy and knew we had to introduce the two. Sister Edwards is a member in our ward from Argentina, they’re family is amazing and she speaks Spanish fluently and is so loving/ We knew that’s what the spirit was directing. So even before Sister Edwards knew, we had already invited her to come to lunch with us and mercy sunday because we knew that’s what needed to happen haha. We called her on the way home and she said she’d love to come. Sadly the next day, Friday we got a call from mercy saying she couldn’t meet with us after all. And although we tried to set up another time she told us she’d call us sometime in the future. Now just isn’t the time. NOW I know that is such a bummer from this incredible story. BUT even though we won’t be teaching Mercy anytime soon, I know that the Lord is preparing people. And that everything happens for a reason. Perhaps we just needed to see Mercy that day to uplift her and for her to know that she is a daughter of God. Regardless of what the current situation is, we followed the spirit and a miracle happened. Remember how much Heavenly Father loves you most of all. Oiiii to my amazing family! so much happened this week where to start! Okay so tuesday we did service at the senior center for their wild west day. I saw that we had a senior center and thought we could come and offer service. I guess previous missionaries had never done that so they were thrilled to have us. Pretty fun talking with old people, they’re so cute. Except when you knock on their doors when tracting-not so nice/cute anymore haha. Lets see we did A LOT of tracting this week. 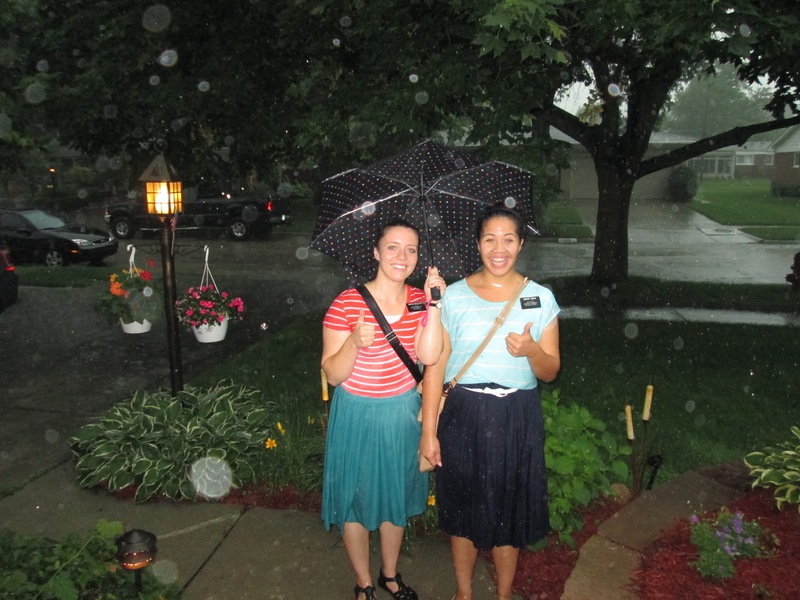 One day consisted of tracting in a thunderstorm. It had been fine and then it just started pooring. Didn’t have our umbrellas with us (left them in the car) and so we had to run back and by that point we just figured we were soaked anyways so we’ll just keep going. No one let us in and/or wanted to listen to us even though we were sopping wet girls coming to talk about a message of happiness haha. BUtttt it was still fun, I’ll attach a picture AFTER we got an umbrella (didn’t help much since we were already soaked). This week President Holmes and Sister Holmes went home 😦 we saw them on their last day since the mission home is in our area. 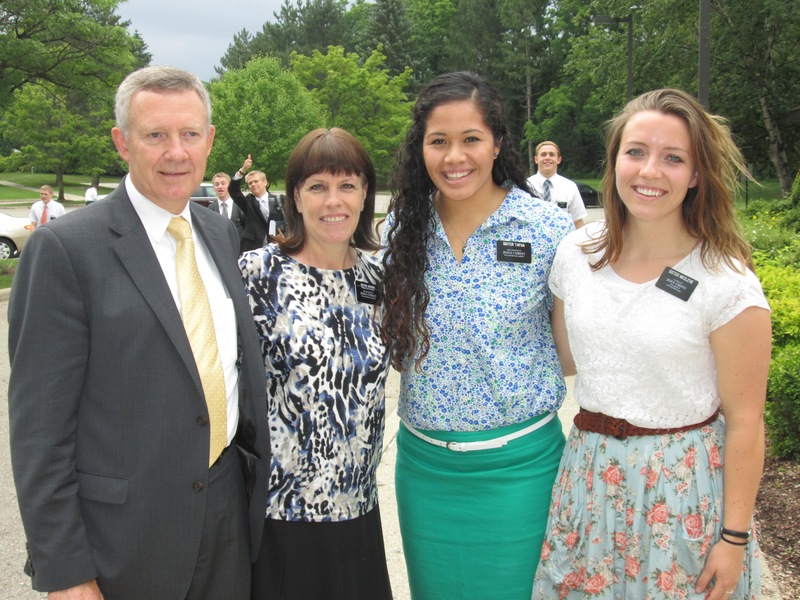 They are amazing, sad to see them leave but now we have a new mission president Gerber! We met him and his wife the other night and Sister Gerber actually went out finding with us her 2nd night in Michigan. Pretty cool. I hope I get to be a mission president’s wife someday-that would be SWEET. Anyways, she was so cute and really had some nice things to say as we knocked doors and people listened. We actually found…a family! Now we don’t have solid return appointment with them but we talked and they said we could come by anytime and gave us their number. They were talking about their beliefs, agency, having a purpose here on earth, the reality of the adversary and His temptations etc. and we just kept grinning and nodding saying “yes, we believe that too”. So hopefully we’ll get to teach them this week! Amy and Scott are the parents 🙂 young family. Kind of wild haha but they’re nice people. Found a 21 year old named Devon who we’re meeting with tomorrow. Really excited for that, he was pretty receptive. We also went finding yesterday with a recent convert sister Morris and we found another new investigator named jose-SUPER nice guy. We’re meeting with him on sunday, he works a lot. Excited for that too. We find a lot of people but no one follows through, so as of this point we have no progressing investigators. Sister Tafua and I continue to work hard and to have faith though. The Lord has people that He needs us to help come unto Christ. On the other hand, we’ve been getting to know the members. Our new Ward Mission Leader is awesome, he’s from England. Dad, I think he knows the Wigglesworths-Brother Gough, young guy in his 30’s anyways maybe steve or even nathan knows him? ANYWAYS We’ve been doing a ton of lessons/fhe’s with members and helping them become more converted to the gospel. And extending missionary challenges 🙂 Which i’m going to extend to you ALL who read this email 🙂 yes besides my immediate family haha. This week give out a mormon.org card! To someone! Anyone who is not of our faith. Invite them to check out the website and to look at the “Beliefs” or “FAQ” sections to learn more about what we believe. I will be wanting soem emails or letters with stories of your cool experiences! We’re visiting a Less active family tonight who haven’t been in a lonnnnnng time. 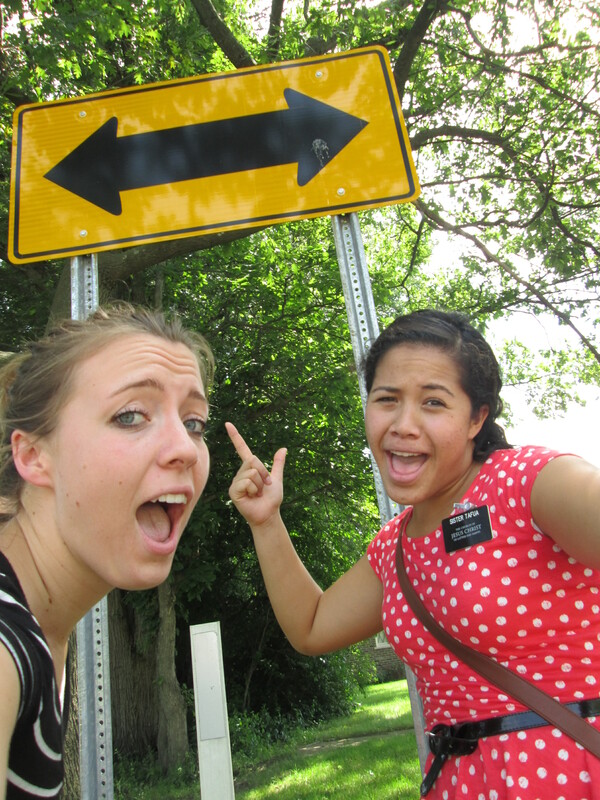 They don’t ever let missionaries come teach them but they said us sisters could come back so we’re really hoping they’ll be home! This week we brought a Less active with us to a baptism that our room mate companions had (sister Sirstens and Cutler-we live with them). She said she felt chills as Hanna (the girl who got baptized) was baptized. SO COOL! We might be going with her this week to a singles ward bbq to help introduce her to friends. Hoping that works out. We went to a place on saturday called Zingerman’s it was in Ann Arbor where the U of M campus is. Pretty much looked like down town bellingham or seattle. i missed being in a college town haha. Anyways lot’s of sweet stuff inside and I got a way good pastrami sandwich. Loren would be proud. Anyways that was fun. I’ll attach a picture. All in the all the work is slowly but surely moving a long. We’re getting the foundation set and who knows maybe I’ll be in this ward ANOTHER transfer and we’ll get to see some baptisms. I know that there are people who need this message of the gospel in their life. Well, everyone does. But people that are ready and prepared now. It is exciting and discouraging at times when we think someone may follow through and they don’t but then we find new people to teach so you just don’t know. You just follow the spirit and be obedient and know that the Lord is HASTENING HIS work. 🙂 We’re in that hastening. Sweet. I continue to learn more every day as I try to train and yet am still learning to be a missionary myself. I’ve only been out 8 weeks for pete’s sake haha. It’s been great though and humbling. The Lord trusts me and I am doing everything in my power to prove to Him that He can trust me. Sister kenz 🙂 I love this gospel. IT IS TRUE! I love the book of Mormon. Studies are wonderfulllll I learn so much everyday. I love it when people we talk to bring up a subject or a thought and I can say “Hey there’s actually a scripture that mentions what you just said or what you believe,here in the Book of Mormon” 🙂 It makes me so happy. I love it. Then When I get to Brazil someday I’ll just have to translate everything I’m saying to portuguese haha oh boy, oh well. It will come. thunderstorm tracting with minha companheira!